9 Astonishing Facts of Blackthorn Fruit to Know. Get Ready to Be Amazed! This is Awesome! 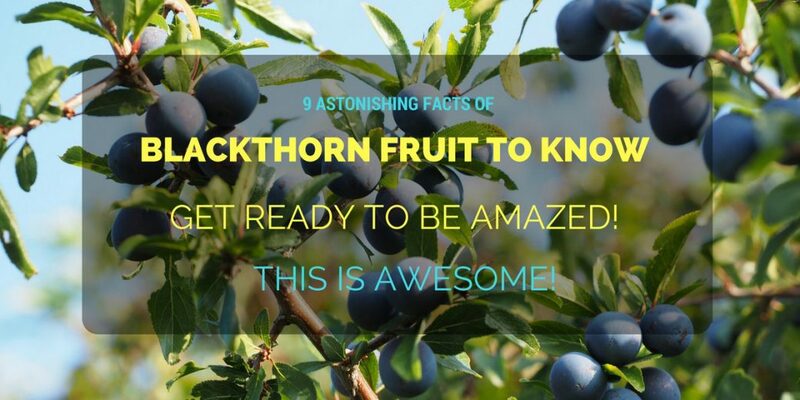 / 9 Astonishing Facts of Blackthorn Fruit to Know. Get Ready to Be Amazed! This is Awesome! Is it your first time to hear about the blackthorn fruit? Or are you curious what this fruit is? Whether it’s a new word to your ears or not, this fruit is amazing for a few reasons. Although not that popular compared to berries, blackthorn fruit has a very delicious taste and contains several benefits good for the health. Without further ado, let’s get right on to these facts. Blackthorn fruit comes from a tree called blackthorn, which is otherwise called as sloe. This is a small, deciduous tree, also regarded as a type of shrub, native to the UK but also found in some parts of Europe, western Asia, eastern North America and New Zealand. Blackthorn belongs to the family rosaceae, the “same genus as almond, cherry and plum trees”. It has a scientific name of prunus spinosa, in which the term “’epithet spinosa’ refers to the sharp pines or thorns” that are obvious physical quality of this plant. Furthermore, this tree grows with dark green and oval-shaped leaves. During spring starting March or April, it blooms with small, white flowers similar to hawthorn’s. When matured which is usually after 20 to 50 years from the time you planted it, the height of this tree reaches to about 6 to 7 meters with a spread from 2.5 to 4 meters, and can stand for up to a century. Blackthorn fruit may be mistaken with blueberries because it looks similarly as the latter. The only difference is that blueberry fruit has navel-like recess on the bottom and has almost perfect round shape. The tastes are different too, in which blackthorn is a bit sour while blackberry is sweet. Blackthorn fruit is a popular ingredient in producing sloe gin. This is a type of red liquor combined with gin and blackthorn drupes. It’s best to harvest the fruits in making some alcoholic beverage after being frosted so most likely after winter. The peel of the fruit must be “punctured and covered with sugar” before adding with gin of your choice. This mixture can be taken fresh but the taste is even better after three months. In fact, sloe gin can be used as chocolate by using the remains (drained) of the fruit-gin mix. Other than that, this fruit can be used in producing tarts, pies, jam, jellies and syrups. You can also prepare some freshly brewed tea through its dried leaves and fruits. To add more, the wood part of this tree can be used as “walking or riding sticks”. This is actually the “traditional wood for Irish shillelaghs”. You may also cut some for firewood. If the blackthorn fruit is useful, so its barks, leaves and flowers. These parts are used to help detoxify and purify the blood. The long term effect of the removal of impurities and toxins from the body is better blood circulation, which ultimately lessens the risk of blood related diseases, including cardiovascular problems. Featuring diuretic properties, the flowers of this tree is able to flush out kidney stones, remove fluid retention and cure other kidney and bladder related problems. Therefore, making some tea from dried flowers and eating more of its fruits regularly can prevent such disorders that affect either kidneys or bladder. If you regularly drink a herbal tea made of dried blackthorn flowers, your digestion is improved in the long haul. Better digestion means less bloating, constipation and diarrhea. It can also help provide relief against upset stomach, dyspepsia and menstrual cramps. Based on studies, blackthorn has anti-inflammatory, astringent and laxative properties. Its fruit can be used as a mouth rinse to remove bacteria or viruses causing sore throat, coughs, tonsilitis and other common oral related issues. It also has a great amount of anti-bacterial agents that help fight bad breath. It can even improve breathing for people with asthma or those who unexpectedly suffer from breathing disorders. The pulp of a blackthorn fruit is also useful as a homemade mask for face. It has a strong astringent property that removes impurities and improves your skin health. As a matter of fact, this fruit contains vitamin C and tannins that help maintain elasticity and reduce stretch marks. If you want to get some blackthorn fruits that you can pick once they are ready to harvest or flowers and leaves to dry, why not have some tree around your house? You can prepare softwood cuttings or propagated seeds that you plant in sand, loam, clay or chalk type of soil but must be moist and well-drained in full sun exposure. Did you find blackthorn fruit or the whole tree to be interesting? Of course, it is! The numerous health benefits can guarantee you an improvement to certain issues you have now or will get in the future. Since it’s all natural, there’s no way to ignore these facts. But it’s best if you have your own source to get the fruits, flowers and leaves. Hence, start considering some blackthorn tree in your garden or backyard! Do Orange Trees Have Thorns? One Way to Find Out!